Hayes & Yeading United earned their first victory under Phil Babb with an impressive performance in the Meadow Park rain to defeat a much fancied Boreham Wood side that contained former United skipper Sam Cox. United were quick out of the blocks as Kamaron English fired in a long shot which home keeper James Russell spilled before it was cleared. However, on five minutes, it was the hosts who took the lead when Jake Reid in attempting to clear a Graeme Montgomery corner, found the top corner of his own net with a header. United responded immediately. 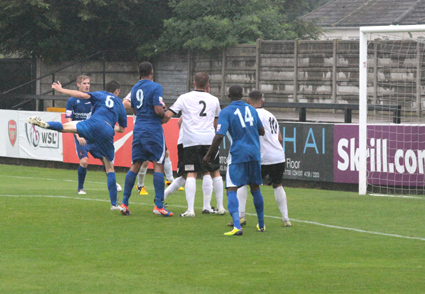 A long Mikhael Jaimez-Ruiz clearance was controlled by Frankie Merrifield who moved the ball forward and as English challenged Russell for the ball, it dropped invitingly for Luke Williams to volley home (Pictured left). Just 11 minutes later, United took the lead in rather unusual circumstances as Tom Bird's deep cross found English on the right and although he seemed to mishit his shot, it eluded Russell at his near post and crept in. Boreham Wood responded as Ben Nunn's long ball was laid off by Matthew Whichelow to Donovan Simmonds who shot first time but across goal. 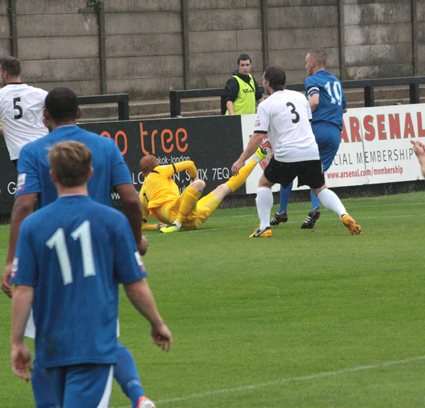 Then Matthew Ball tried two long shots in quick succession but both rose just over the bar. Attention diverted to the skies as a deluge made conditions particularly difficult for a while. Russell was almost caught out by a long, drifting Jack Mills free-kick which caught the wind, but he held onto the wet ball admirably on his goal line. Then Bird's dangerous corner was headed wide by Dean Inman from a good position. United broke quickly from a corner as Reid found English in space with a well judged header. The winger gave him the ball back and Reid advanced before shooting from an angle. Russell parried the firm shot and English skewed his follow-up shot wide of the post. Jaimez-Ruiz gathered in a Mario Noto free kick low to his left, but United remained comfortable going into the half time break. Wood started the second half with a lot of possession but little threat and it was in fact United who had the first chance as Merrifield found Adam Everitt in space and his cross found English's head. However, Russell was able to save low to his left. 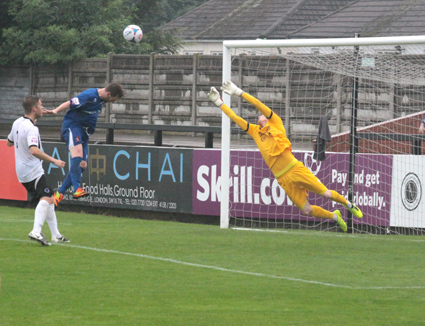 Williams then fired a low shot on target but Russell made a comfortable save. United had a great chance on the hour as Anthony Furlonge took a throw in which Reid cleverly flicked inside. It all opened up for Williams as he burst through on goal but unfortunately, he shot straight at Russell. It wasn't to matter as ten minutes later United did get their third as Inman headed in firmly from Williams' corner (Pictured above). Boreham Wood changed their shape in response and former United winger Graeme Montgomery popped up on the right to get on the end of Greg Morgan's cross-field ball but fired just wide of the near post. 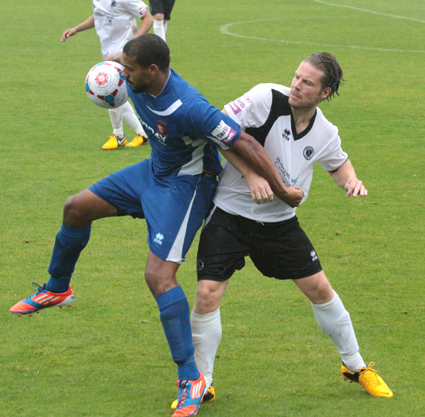 Then, Montgomery sent over a deep cross which Furlonge did brilliantly to head behind under pressure. 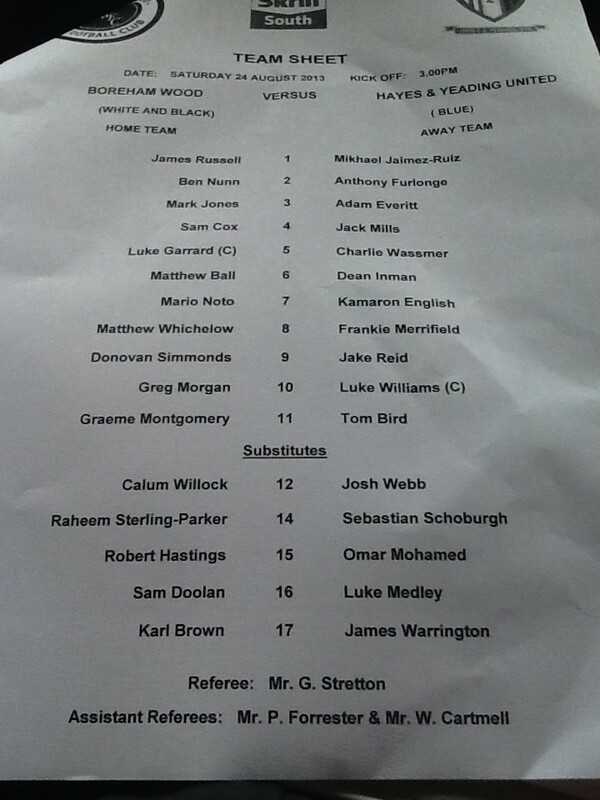 Jaimez-Ruiz then saved well from Calum Willock's angled drive and Mark Jones's long range pile driver. Robert Hastings mishit a shot in front of goal which Jaimez-Ruiz gathered in but aside from this, after an incredible 10 minutes of stoppage time, United's resolute defence remained untroubled and held out comfortably for their first win of the season. United Man of the Match: Charlie Wassmer.